Once you have your phone, the first order of business is to boot it up. Many prepaid phones try to force the user to go through an activation process. There is always a back door for installers to exit the process though. In the case of the Exceed 2, simply pressing volume up, volume down, back, and home quits out of the activation process. Some applications require root permissions. To achieve this, your best bet is to do a bit of Googling for your particular phone model. The XDA developers forums are a great resource for this. While prepaid phones don’t usually have communities behind them like flagship phones, you can often find at least some information on what it takes to root your particular device. The most well-known “root every device” application to date is towelroot, created by GeoHot. You might remember [George Hotz] aka GeoHot as the first person to jailbreak an iPhone. He also made the news by getting into a bit of hot water with Sony over some PlayStation 3 security holes. Towelroot uses a Linux kernel exploit (futex) to gain root permissions. Released in June of 2014, the futex exploit has been patched on most new phones. However, it hasn’t been patched on phones that receive relatively few updates – like prepaid phones. On the Exceed 2, Towelroot works perfectly, giving the user root without even requiring a reboot. Once the phone is rooted, a root privilege manager like SuperSU is needed to keep track of which applications should have root permissions. Once that is done, anything goes! We’ve found packages like BusyBox to be huge helps – especially when working at the console through Android Debug Bridge (ADB). Between these low-cost phones and the used phones every family seems to have floating around now, there are a heck of a lot of devices out there waiting to be used. What can you do with a spare Android phone? Quite a lot. There has never been a better time to learn to code for the Android Platform. Android Studio is the current official development environment. If you know a bit of Java, it’s easy to jump in and start making apps. If you’re not a Java head but want to learn, there are tutorials all over the web to help get into the swing of things. Not a coder? The swiss army knife of automating android devices has long been Tasker. Tasker allows you to set off simple scripts (called tasks) with triggers which can be anything from plugging in headphones to connecting to a particular WiFi access point, to pressing a button on the screen. Want your smart phone to announce your arrival home with your own theme music? Just set up a Tasker profile to play a song when it connects to your home WiFi router. Tasker supports plenty of actions natively, and can be extended with plugins. Scripting Layer For Android SL4A) even allows it to extended with Python scripts. Moving into the hardware world, there are plenty of ways to get GPIOs from an Android phone. The Android Accessory Development Kit (ADK) is getting a bit long in the tooth, but it’s still a great way to interface an Arduino board like the Arduino Mega ADK with your device. Another option for getting into the hardware realm is the IOIO OTG board. As the name implies, this new version of the IOIO board supports the USB OTG standard. This allows it to connect a phone either as a host or as an accessory. Need a simple wireless terminal for your project? Grab a terminal app and a Serial Port Profile (SPP) compatible Bluetooth module, and Bob’s your uncle. Interested in hacking with the ESP8266? There is an entire page of apps on the Google Play store dedicated to interfacing with everyone’s favorite low-cost WiFi module. We’ve just covered the tip of the iceberg here. What kind of hacking would you do with a spare Android phone, or one of these low-cost prepaid devices. Let us know in the comments! Exploring the relation between sound and textile and experimenting with the boundaries of our senses whilst changing the way we perceive fabric, surfaces and their manifestation as sound. 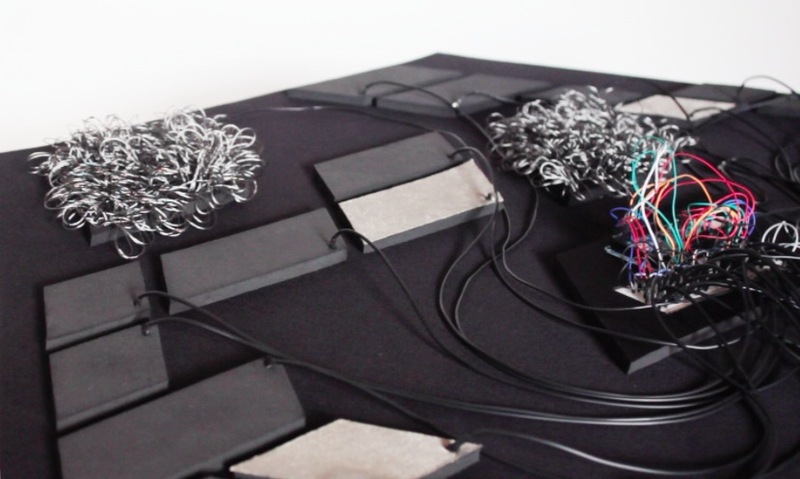 Recontextualizing our tactile interaction with textile acting as an interface, where each element triggers, affects and modifies the generated sound’s properties. Creating a soundscape through sensor technology enticing audiophiles to interact and explore with reactive textile elements.The nexus of the body, the senses and technology. OCHO TONOS is a symbiosis of the unique hand-crafted traditional textile techniques and the immaterial digital media. Thanks to Arduino Mega ADK , all inputs coming from the touch of the user on the soft sensors are translated into a digital platform, parsed and filtered through MaxMSP, in order to control the generation of a soundscape in Ableton Live. Ocho Tonos was chopped, spiced and cooked at Kitchen Budapest. Sounds used are samples from the working machinery at TextielLab. Uses a smartphone to operate. It can be an assistant, pet, or a telepresence device. Can be anything depends on the mobile app you write. I know, I didn't post for a while. Didn't have time to post some of the projects, sorry about it. Alright, so here is our new project, we plan to go commercial with it. It is called Mobiton. It is a robotic shell for mobile devices (android currently). You can dock your phone on the device, an application written for the robot pops up and it brings the robot to life. The ADK2012 is based on the upcoming Arduino Due platform and the new Arduino IDE that supports programming ARM targets. Currently the IDE works only on the Google ADK board released at Google IO, while the official launch of the Arduino Due is due later in the year. In his blog, Charalampos describes his experience with SeeedStudio’s Grove Ear-clip Heart Rate sensor and Cosm (former Pachube) cloud service. The employed sensor is quite cheap and can detect heart pulses from the ear lobe, by measuring the infra-red light reflected by the tissue and by checking for intensity variations. By connecting this sensor with an ADK board and, in turn, with an Android smartphone, Charalampos implemented a portable heart-rate tracker, which is used to send the recorded data to Cosm cloud service. For more information and sample code, see here. The next time while organizing a barcamp you can display this cool hack for two great reasons: The obvious being to look cool, the other reason being well, there is Arduino and beer involved! Where both are cool. Aptly named KegDroid, this beautiful beer dispenser was built by a google employee, Pall Carff, uses NFC reader to identify users and dispense beer. It’s not just the beer dispensing that sounds awesome to us, oh no. KegDroid is packed to the brim with all sorts of clever tech, mostly from Google’s labs. The giant robot has a Motorola XOOM tablet running Android 4.0 Ice Cream Sandwich jammed into its belly, which runs a custom app designed by Paul. An NFC reader sits between the two drip-catchers and interfaces with specially made NFC tokens, sending a message to an Arduino computer board that’s inside the case, which then controls the beer pouring from the taps situated in the arms of the Android robot. So the next step can be a humanoid beer robot fetching us beer to our table when tweeted with an @RestaurantName with #tablenumber ?